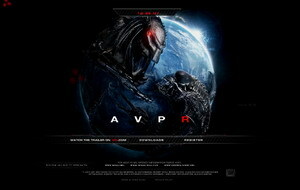 The Official AvP Requiem Website has been updated. I’m having some problems though. Sometimes, the new site will load, and other times it won’t. There’s a Downloads link which funnily enough doesn’t work for me either. Apparently, there’s some wallpapers on there. The website also has the release date listed as the 26th now, a day after its previous release date. Thanks to Yellow Alien for the news. Update: The three wallpapers can be found in this post on the forum. The Downloads is inactive at me as well. Funnily is not a word. Wont let me click downloads either. I keep hitting refresh. The site hasn't updated. Die by my plasmacaster, Predalien! The intro's nice ButI can't click downloads, maybe it's a problem they'll fix soon. Have to say, even though it's relatively simple, I'm very impressed by the introduction animation. The red tint and camera lens give an interesting sense of atmosphere. I can't even get into it! It still says "Coming Soon"
It works when you write it with "www"! That site is so cool!.even though i loved AVP its site sucked,big time.In the words of Swarzenhogger"This is getting bettr by the minute!" . Only (roughly) 83 days untill the movie release!.Plus its Oct,so by next weak they'll probably start showing the trailers on T.V.!!!! .